Our next pick has a smaller cup capacity to the other coffee makers we have looked at, it makes 4 cups of coffee, which is very well suited for someone who isn’t a big coffee drinker or someone who lives on their own, or for a small household. The coffee maker is smaller too, so makes a good choice for a smaller kitchen, and won’t take up a lot of space. We are going to go through some of the main features and have a look at the price and functions. 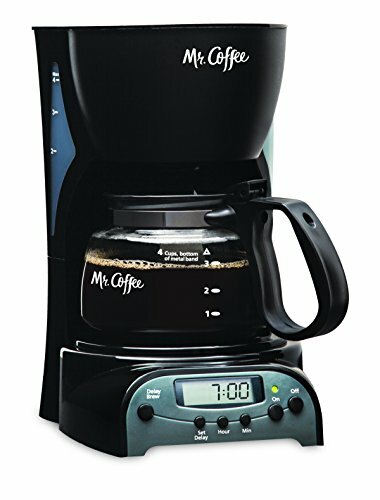 The Mr. Coffee DRX5 4­Cup Programmable Coffeemaker is a good choice if you have a busy schedule as you can program it to make your coffee up to 24 hours in advance, so that the coffee will be ready when you are, for your fresh, hot coffee. This coffee maker has a an on/off indicator light to let you know if the machine is on or off, and will automatically turn itself off after an hour, which is really good feature, takes away the worry of going out and wondering if you have left it on or not. As with the other Mr Coffee makers we have looked at, the filter basket can be quickly and easily removed for cleaning and filling, it can be used with paper filters or a permanent basket filter( which can be bought separately) depending on your preference. The Brewing pause ‘n serve feature allows you to get your coffee while the maker is still brewing, so if your impatient for your first cup of the morning, you can pour yourself one and then the coffee maker can then continue brewing. With the dual water window, you can easily view how much water is in the reservoir, showing the water level from both sides so that you can accurately fill it up with the right amount of water, taking out the guesswork. 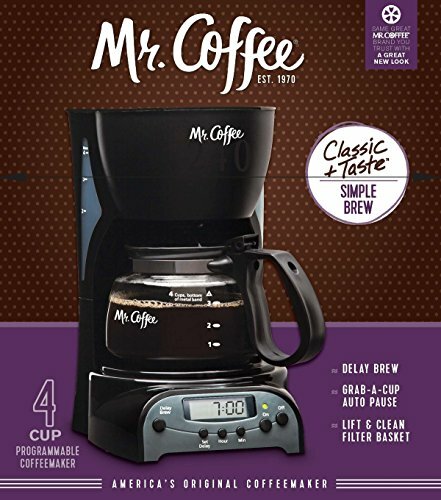 The Mr. Coffee DRX5 4­Cup Programmable Coffeemaker is a great value for money for a smaller capacity use, it is a nice and easy to use and clean product, with some useful features, like auto switch off and setting in advance a very popular choice and very affordable. WHAT’S THE BEST MASTICATING JUICER OF 2016? Masticating Juicer or Centrifugal Juicer: Which One is Best?